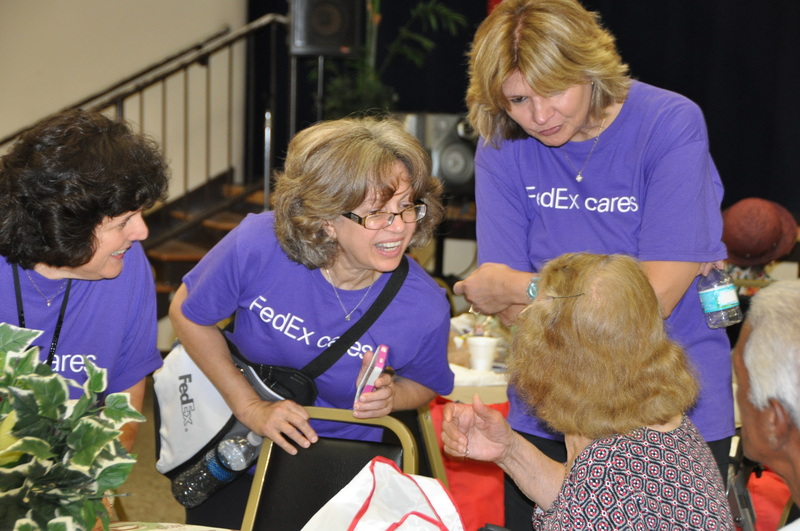 FedEx employees visit with Seniors First clients during United Way’s multi-company Day of Caring. Day of Caring starts with Heart of Florida United Way’s multi-company, multi-location volunteer effort that tackles dozens of projects across the community in a single day. It happened again when 200 Publix volunteers pulled together for their Day of Caring, and again when 1,000 Lockheed Martin volunteers came together for theirs. 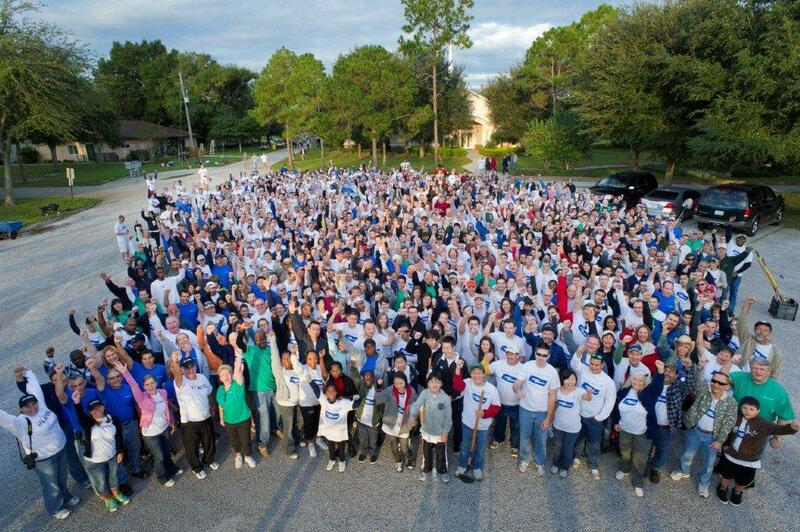 Day of Caring is Central Florida’s largest community-based volunteer event. On September 26, multiple companies rallied volunteers to take on projects across the entire community. In Osceola County, volunteers built vegetable gardens at a senior living facility. In Orange County, preschoolers were taught about how to be healthy, and in Seminole County, volunteers rose early to help feed the hungry. Roughly two weeks later, Publix employees descended upon homes in the Winter Park neighborhood Winter Park Oaks to re-paint 10 homes and do some minor landscaping. 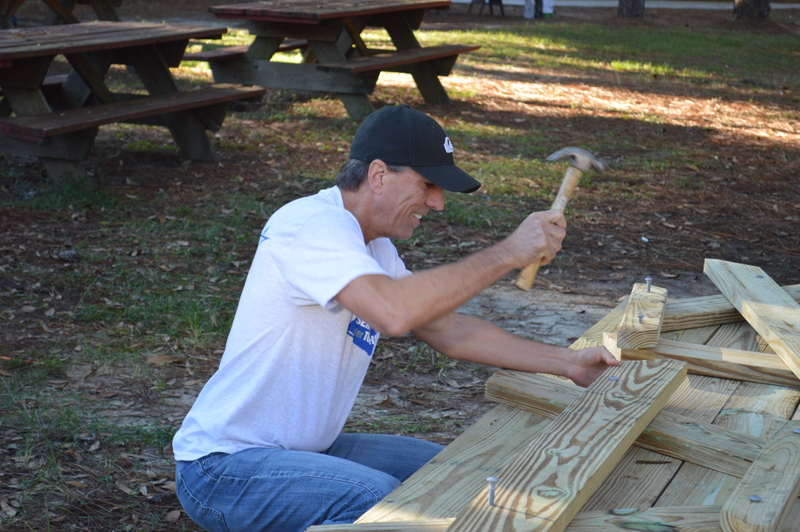 On October 18, Lockheed Martin hosted its Day of Caring at Quest Camp Thunderbird in Apopka, completing numerous projects ranging from landscaping and painting to repairing screened porches. For the 22nd year, Heart of Florida United Way (HFUW) mobilized hundreds of volunteers from nearly 30 local companies to contribute to Days of Caring, a massive one-day volunteer effort. In Orange County, 170 Publix volunteers concentrated efforts to repair, better secure and beautify homes in specific neighborhoods. Eight homes owned by the Hannibal Square Community Land Trust, a nonprofit that provides affordable housing within the Winter Park Community Redevelopment area, were enhanced with home safety features by utilizing hurricane preparedness and theft mitigation techniques. In Seminole County, volunteers from Fifth Third Bank supported HFUW partner agency SafeHouse of Seminole and its You Are Never Alone (Y.A.N.A) Project, which provides a facility where parents can safely see their children when a court has determined that their visit must be supervised. Fifth Third Bank volunteers restored a playground at the Y.A.N.A Project office by installing a privacy fence, washing the equipment, weeding and completing other general maintenance. Throughout Central Florida, more than 500 volunteers from Publix, Fifth Third Bank, Nordstrom and FedEx, among others, donated their time to the service effort in HFUW’s tri-county area, which equates to over $36,000 in value to the community (based on average value of volunteer hours as determined by Independent Sector). Many companies that participate in workplace giving campaigns use Days of Caring to demonstrate the widespread value HFUW brings to Central Florida. 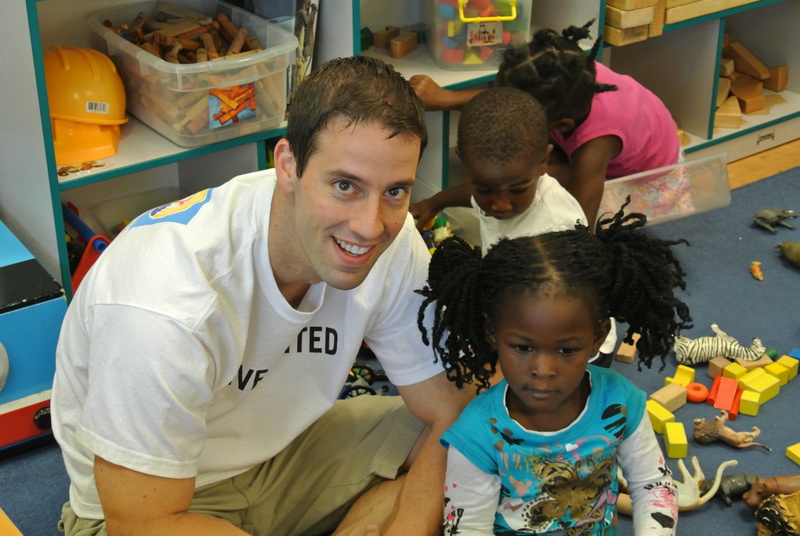 Serving at Orlando Day Nursery, this volunteer is one of more than 2,000 corporate employees taking part in United Way Days of Caring. United Way Days of Caring, Central Florida’s largest community-wide volunteer event, kicked off Friday, Sept. 28, with great success thanks to a wave of more than 1,000 volunteers who fanned out all across Orange, Seminole and Osceola counties! With the majority of activities taking that day, nearly 60 projects were completed – everything from playing with children at Orlando Day Nursery and painting walls at the Coalition for the Homeless to hosting bingo parties at Senior’s First and reading to local school children. Each project provided much-needed assistance to United Way partner agencies, while giving companies a great way to give back, build teamwork and LIVE UNITED. The event will conclude later this month when more than 1,000 Lockheed Martin employees will tackle projects at The Salvation Army and eight other local agencies. As the event’s largest supporter, Lockheed Martin leads the way every year in the sheer number of volunteers, impact and enthusiasm. In addition to Lockheed Martin, United Way would like to thank Publix, Florida Hospital, Fifth Third Bank, Wells Fargo, CNL Financial Group, Coca-Cola, Liberty Mutual, Nordstrom, Enterprise Holdings, General Electric, Orange County Government and many other great partners who supported this year’s event. Want to see Days of Caring volunteers in action? Click here to view our photo gallery. Also check out our Facebook page to tag yourself, friends and company! Did you miss Days of Caring, but still want to volunteer? The United Way Volunteer Resource Center makes it simple to get involved. Click here to learn more. Want to make a difference in our community? Are you looking for a meaningful volunteer opportunity for your office or organization? Then sign up today for United Way Days of Caring, Central Florida’s largest community-wide volunteer event. Last year, more than 1,000 Lockheed Martin volunteers helped spruce up Edgewood Children’s Ranch. In addition to helping those in need, Days of Caring offers a wealth of benefits to those who participate. Pre-planned projects provide fun team-building experiences, as well as terrific opportunities to touch lives, learn more about community needs and recognize the importance of volunteerism. Last year was our biggest, most successful event ever with more than 2,000 volunteers from Lockheed Martin, Publix, Ernst & Young, UPS, AT&T and 50 other leading companies taking part. In all, 72 projects were completed, providing much-needed assistance to local nonprofits and the people they serve. Publix volunteers at Second Harvest Food Bank. Simply click here to choose your project and get started. For more information, contact Jessica Schwendeman, United Way Community Participation Manager, at (407) 429-2136 or e-mail Jessica.Schwendeman@hfuw.org. You are currently browsing the archives for the Days of Caring category.